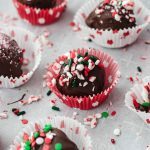 5-ingredient healthy chocolate peppermint truffles have a doughy center that is coated with a crunchy chocolate shell. A satisfying under 100 calorie healthy holiday dessert. Line a baking sheet with parchment, wax paper or foil and set aside. In a food processor, process chocolate graham crackers until fine crumbs remain. In a separate bowl, soften cream cheese in microwave for 15-20 seconds. Add peppermint extract to cream cheese and mix to combine. Add cream cheese and peppermint mixture to food processor with processed graham crackers. Process until doughy mixture forms. Using a cookie scoop, form dough into balls and place on lined sheet pan. Place in the refrigerator for 5 minutes. While the truffles are in the refrigerator, microwave chocolate chip and coconut oil in a small microwavable bowl. Microwave chocolate on high for 30 seconds, mix then again for another 30 seconds until it becomes a chocolate sauce. Remove truffles from refrigerator and dip in chocolate sauce. Place back on lined baking sheet and sprinkle with desired toppings.